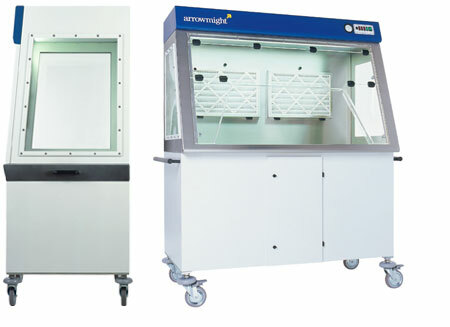 A Class I type Cage Cleaning Cabinet offering a working area with negative pressure 1380mm (w) x 750mm (h) and 675mm (d). It features carbon filtration to 99% efficiency for solvents and odours, exhaust filtration, and a ‘safe change’ 60 litre pivoting waste bin and the control panel includes filter and air pressure indicators and alarm. Carbon filtration to 99% efficiency for solvents / odours etc.